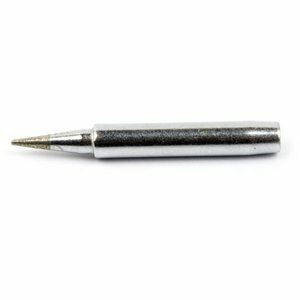 Conical shaped long-life soldering iron replacement tip Pro'sKit 5PK-SC107-T5 allows precision component soldering and designed to provide maximum heat transfer from the heater to the tip. Pro'sKit 5PK-SC107-T5 soldering tip is compatible with Pro'sKit 8PK-SC107B Soldering Iron. This soldering iron tip has a copper base and conical shape. Inside of the tip there are nickel and chromium inlays. The iron tip may work less if you use a lead solder, than when you use lead free solder. Soldering iron tip thermal conductivity worsens when oxides stick to it. To clean a tip use moist cellulose sponge. If it doesn't help, use special tip cleaner.